Welcome to our new blog! Come Kick it with us TOMORROW in the BK! 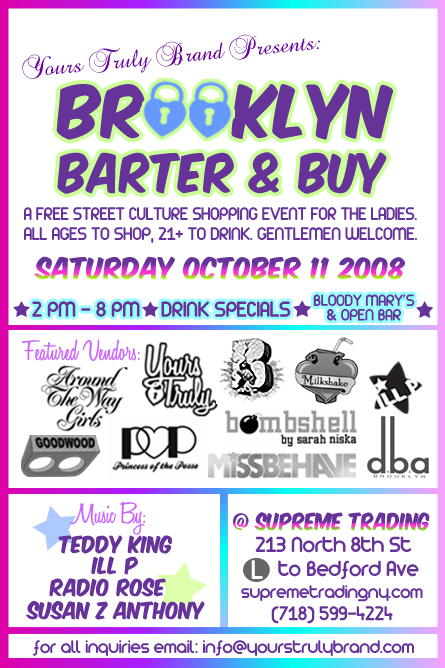 Team Milkshake will be participating at the Brooklyn Barter & Buy, Saturday October 11. They’ll hook you up with some art for your feet. Get your shop (and your cocktail, if you’re 21) on and come say hi! You are invited to join us for a day of shopping and fun this Saturday, October 11th, 2pm to 8pm @ Supreme Trading; 213 N. 8th St, Williamsburg, BK 11211. There will be drink specials, bloody mary’s and a special open bar. This entry was posted in Uncategorized and tagged Brooklyn, Ill P, Milkshake Kicks, party, shopping, Team Milkshake, Yours Truly. Bookmark the permalink.